Throughout time, humans have learned to exist in many locations on the earth. The interaction of humans with the environment (surroundings) in these locations has often brought major changes in that environment. Some changes were good, some were bad. Many times the bad changes were caused by humans making too much of a change in the environment, by using or abusing the natural resources (anything found in nature) present. Every location where the human race has lived contained a community of plants, animals, insects, and other natural resources. A community of organisms, other natural resources, and their influence on each other is called an ecosystem. The plants and animals existing in an ecosystem are those most adapted to that particular environment. Changing or using natural resources will affect the entire ecosystem, since an imbalance in the system is created. Ecosystems naturally change with time. In most cases, the change does not completely destroy the ecosystem, because a new, slightly different ecosystem can b`e created with the natural resources that are currently in place. Ecosystems can be destroyed, however, if the change is made too quickly. The scope of Pollution and Environment extends from bounded systems such as watersheds to spatially complex landscapes, to the Earth itself, and crosses temporal scales from seconds to millennia. 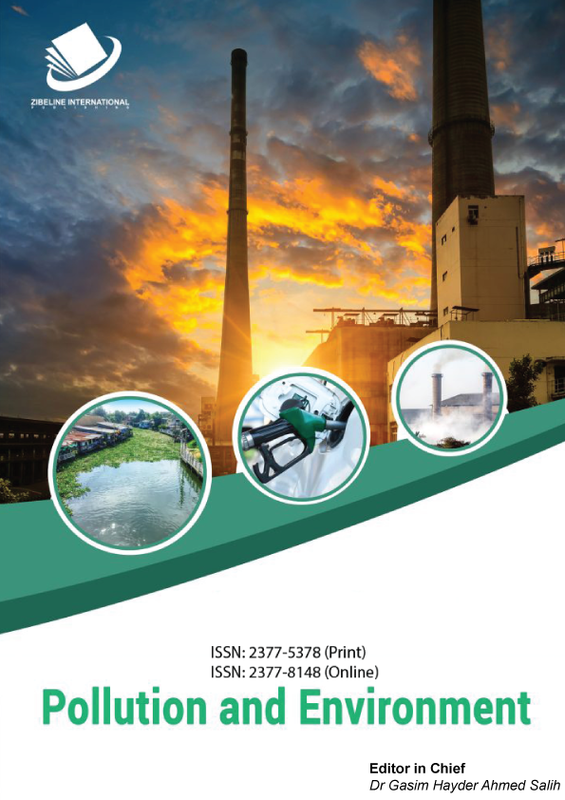 Pollution and Environment has strong links to other disciplines including landscape ecology, global ecology, biogeochemistry, aquatic ecology, soil science, hydrology, ecological economics and conservation biology. Studies of ecosystems employ diverse approaches, including theory and modelling, long-term investigations, comparative research and large experiments. Pollution and Environment publishes scientific articles dealing with the interface between ecosystems and the natural environment, specifically how ecosystem influences the environment and how changes in that environment impact ecosystems. Preference is given to papers from experimental and observational research at the field, system or landscape level, from studies that enhance our understanding of processes using data-based biophysical modelling, and papers that bridge scientific disciplines and integrate knowledge. All papers should be placed in an international or wide comparative context. All manuscripts are initially screened on their topic suitability and linguistic quality. Biological and physical characteristics and dynamics of ecosystems. Ecology, diversity and sustainability of ecosystems. Relationships between ecosystems and the natural environment, including land, air, and water. 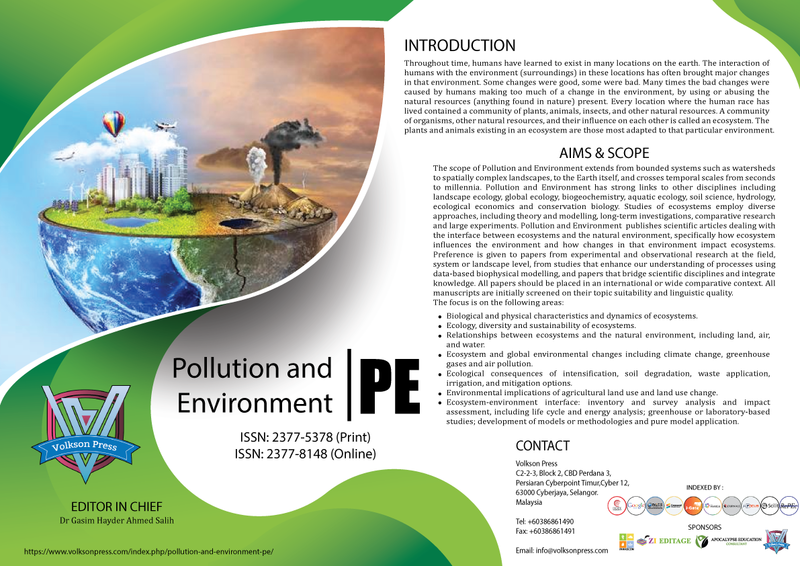 Ecosystem and global environmental changes including climate change, greenhouse gases and air pollution. Ecological consequences of intensification, soil degradation, waste application, irrigation, and mitigation options. Environmental implications of agricultural land use and land use change. Ecosystem-environment interface: inventory and survey analysis and impact assessment, including life cycle and energy analysis; greenhouse or laboratory-based studies; development of models or methodologies and pure model application.